Marianna Dyson (speaking, left), of counsel, and Mike Chittenden, special counsel, both of Covington & Burling, present to more than 170 attendees. 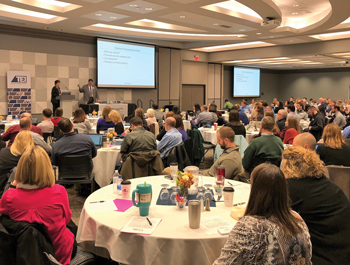 TEI’s Nebraska Chapter held a full-day CPE/CLE event on November 13, 2018, at the Scott Conference Center in Omaha. The event drew more than 170 attendees representing over thirty-five companies from Nebraska, Iowa, and South Dakota. The president of the Nebraska Chapter, Kevin Meehan, was excited about displaying the new TEI logo, which was just released two weeks earlier at the TEI Annual Conference in San Diego. The event began with a Washington update from Rohit Kumar of PwC. Marianna Dyson and Mike Chittenden of Covington & Burling then presented on tax reform and fringe benefits. 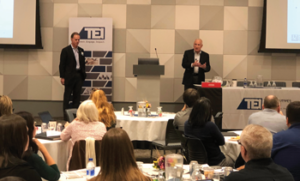 Fred Marcus and David Hughes of Horwood Marcus & Berk followed with a lively discussion on the Wayfair decision and its impact. 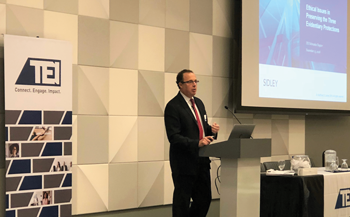 After a lunch break, Matt Lerner of Sidley Austin presented on privilege, and then Pat Reynolds of the Council on State Taxation (COST) and Kathleen Quinn of McDermott Will & Emery led a discussion on states’ reactions to federal tax reform. Steven Johnson and Jennifer Breen of Morgan Lewis & Bockius led the final discussion, which centered on Circular 230 standards on ethics and professionalism. In addition to the annual fall education day, the Nebraska Chapter holds six monthly lunch meetings and an annual full-day spring education event. Matt Lerner, partner, Sidley Austin, leads a discussion on privilege. David Hughes (left), partner, and Fred Marcus, principal, both of Horwood Marcus & Berk, present on Wayfair and its impact.